1) Polar bear numbers overall have increased, despite the appearance of a ‘stable’ global population since 2001 and significant declines in Arctic sea ice coverage in summer. The global population estimate generated by the PBSG (20,000-25,000 bears, as of July 2013) has been virtually unchanged since 2001, giving the impression that declines in some subpopulations have been offset by increases in others. However, adjustments to a few subpopulation estimates (primarily changing estimates that had formerly been included in the total to zero (0), without adjusting the total downward) suggest that the actual numbers must have increased by 2650 to 5700 bears since 2001. These increases in total polar bear numbers have occurred despite declines in the amount of sea ice remaining in September (Fig. 1 below) and a trend to earlier dates for the summer breakup of sea ice in regions such as Hudson Bay and Davis Strait. Figure 1. 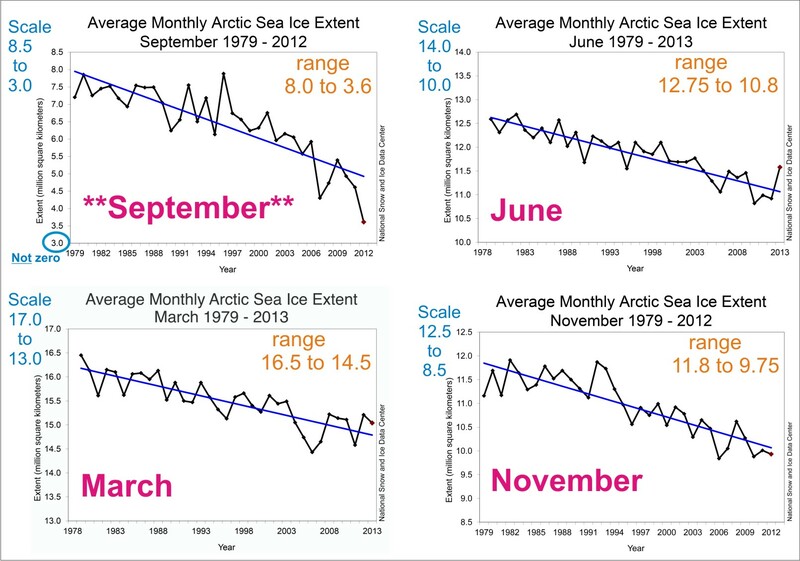 The graph that has some people worried that Arctic sea ice is in a “death spiral” – it shows the decline in extent of Arctic sea ice (in million kilometers squared) in September each year (the yearly minimum), based on satellite records since 1979. Note that the scale on the left axis does not go to zero. Courtesy the National Snow and Ice Data Center (NSIDC). See Fig. 3 for another perspective. 2) Davis Strait polar bear numbers have increased, despite declines in body condition and summer sea ice. Recent research on the Davis Strait subpopulation (Fig. 2) reported that declines in body condition (relative fatness) have occurred since 1978, yet sea ice declines did not begin until the 1990s. Despite the decline in body condition, the number of polar bears in Davis Strait increased significantly. In fact, the density of bears increased to such an extent that researchers could not determine whether the high density of bears or the declining sea ice, or both, was responsible for the decline in body condition. A similar phenomenon has been described in the Barents Sea, where polar bear population numbers appear to have stabilized (or are increasing very slowly) after a rapid post-1970s increase. Andrew Derocher, based on work in the Barents Sea between 1988 and 2002, concluded that he could not tell if the smaller litter sizes and increased number of adult bears were due to the high density of bears or changes in sea ice. The Western Hudson Bay subpopulation (see 5 below) also shows signs that stabilization following a rapid population increase might have occurred. This is a major concern: if polar bear researchers can’t tell the good news (effects of population increases) from the bad news (effects of declining sea ice) from the information they collect on populations, it means that none of it is definitive for determining if global warming is harming polar bears. 3) Baffin Bay polar bears have experienced modest declines in body condition since 1980 and during that period, breakup of sea ice advanced by 2-3 weeks. However, it is not clear whether the sea ice changes can be blamed for the decline in body fatness or not because the population estimate has not been updated since 1997. Figure 2. Map of the 19 polar bear sub-populations. Courtesy the Polar Bear Specialist Group (PBSG), with labels added. SB, Southern Beaufort; NB, Northern Beaufort; VM, Viscount Melville; MC, M’Clintock Channel; LS, Lancaster Sound; GB, Gulf of Boothia; NW, Norwegian Bay; KB, Kane Basin; WH, Western Hudson Bay. 4) Polar bears in the Chukchi Sea are in very good condition and reproducing well, despite decreasing amounts of sea ice in late summer and assertions by the PBSG that Chukchi bear numbers are declining. However, almost-published reports from a recent survey (2008-2011) indicate that Chukchi polar bears are now doing very well indeed: they are in better condition than they were in 1986-1994 (better than all but one out of eight other populations), and there have been no declines in cub survival or litter size (which are “among the highest reported for 18 of 19 polar bear populations”) despite the fact that the amount of sea ice remaining in September has declined substantially (according to the PBSG 2009 July 4 press release, the Chukchi Sea had “one of the highest rates of sea ice loss in the Arctic”). 5) Western Hudson Bay has not experienced progressively earlier breakup of sea ice since 2006, despite record breaking declines in global September ice extent, and a recent survey suggests the formerly “declining” population has rebounded. While Western Hudson Bay polar bears experienced a modest decline in numbers between 1998 and 2004, a more recent survey showed that this decline has not continued as predicted. Also, it turns out that much of the data used to support the claim that polar bears have continued to be harmed by sea ice declines is either unpublished, woefully out of date, or both. For example, while bears there showed declines in body condition, there is published data up to 2004 for lone females only and up to 1998 only for males or females with cubs; litter size declined but there is data up to 1998 only; cub survival declined, but there is data up to 1992 only. These effects may be the result of a rapidly increasing population that has stabilized, as described for Davis Strait (see 2 above). In addition, there has not been another very early breakup in Hudson Bay like the one that occurred in 2003 and breakup dates have been highly variable year-to-year. Western Hudson Bay polar bears left the ice in 2009 at about the same time as they did in 1992 and break up this year (2013) was not early, but about average: as late as June 30, there was still a considerable amount of ice in Hudson Bay and bears left the ice early-to-late July. 6) Southern Beaufort polar bear numbers have not declined, even though summer ice declined and body condition of bears deteriorated. More importantly, researchers are attributing declines in body condition of Southern Beaufort bears to the amount of open water in summer, which is distinctly at odds with evidence that suggests recurring bouts of thick ice in spring is the real culprit. During every decade since the 1970s, spring ice has been especially thick for two or three years, limiting ringed seal pupping habitat. Without the usual glut of ringed seal pups in spring, some bears in heavy ice years struggled to find enough food. This recurring phenomenon is well documented in the scientific literature and includes descriptions of starving bears seen in the spring of 1974. However, by 2009, polar bear biologists started to shift the blame for the poor-condition bears they encountered onto the declines in ice in late summer. Bears that had been starving in the spring (due to thick ice) were counted as “poor” condition bears later in the summer — voilà, a false correlation between ‘more open water’ and ‘bears in poor condition’ was made. 7) Southern Hudson Bay bears live further south (below 600N, see Fig. 2) than any others and while you might expect that Southern Hudson Bay should be suffering more harm from global warming, they aren’t. In fact, ice conditions in Southern Hudson Bay are virtually identical to Western Hudson Bay but Southern Hudson Bay polar bear numbers have been stable. In addition, contrary to expectations, despite a modest decline in body condition, there have been no changes in cub survival. 8) Ringed seals, the primary prey of polar bears, are not being negatively affected by declines in summer sea ice, according to a new study. Although ringed seals are now considered by the ESA to be “threatened” due to global warming, recent publicly-presented research results on ringed seals in the Chukchi Sea indicates they have not been harmed by declining levels of September sea ice. Contrary to predictions, body condition of ringed seals has been stable since the 1970s; they are also growing faster now than in the past, and pup survival has improved — despite the fact that both ice and snow conditions have changed. In other words, less ice appears to be better for ringed seals. 9) There has not been a single published or media report of cannibalism amongst polar bears anywhere in the world since 2011, despite the record-breaking low ice extent reached in September 2012 (Fig. 1). Only one observation of cannibalism is known to have involved a starving bear in the fall and that incident occurred nearly 30 years ago, in 1984. The 2011 events involved fat bears in good condition, not starving bears. Anecdotal incidents of cannibalism (or collapse of maternity snow dens) cannot be interpreted as “observations consistent with predictions of the effects of climate warming,” as Stirling and Derocher contend. Rather, these events are being used as emotional triggers to elicit media attention, donor contributions to activist organizations like the World Wildlife Fund and Polar Bears International, public sympathy for “the plight” of the polar bear and support for listing them as an endangered species. 10) Recent incidents of hybridization are not due to polar bears moving inland or spending more time on land, as a new paper co-authored by Ian Stirling contends. These hybrids are not evidence of either species responding to the decline in summer sea ice but rather, are the result of male tundra grizzlies moving north across the extensive sea ice that exists in spring and mating with polar bear females feeding on the sea ice. 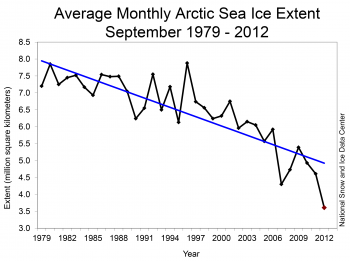 As the monthly sea ice extent graphs for 1979 to 2012/2013 in Fig. 3 (below) show, while concern over the “Arctic ice death spiral” focuses on the dramatic changes in September values, there has been much less difference over time for March, June and November values. These months are far more relevant to polar bear health and survival than September, since November through June is when polar bears really need sea ice — especially during the critical feeding period, which runs from March through June in all regions. While the decline in ice extent is greatest in September, all evidence suggests this is the least important month of the year for polar bears – the yearly ice minimum in September occurs after the critical spring/summer feeding period, after the spring/summer mating period and well before the winter birth of cubs. Figure 3. Sea ice extent graphs for September compared to March, June and November. Ranges given are approximate; note the differences in scale for each graph, which is far lower for September than all of the others. NSIDC graphs, colored labels added. See Fig. 4 (added 22 Jan. 2015) for March vs. September using the same scale. Figure. 4. This is Figure 4.2 from the Sea Ice chapter of NOAA’s “Arctic Report Card 2014.” See my discussion of the “Polar Bear” chapter here. It really shows how small the decline of spring sea ice has been relative to summer. Less summer ice ≠ few bears (Davis Strait; S. Hudson Bay; Barents Sea; S. Beaufort; W. Hudson Bay). Less summer ice ≠ “skinnier” bears (Chukchi Sea; S. Hudson Bay). [Less summer ice = “skinnier” bears (Baffin Bay; W. Hudson Bay, up to 1998 & 2004 only; S. Beaufort, based on false correlations). “Skinnier” bears ≠ fewer bears (S. Hudson Bay; S. Beaufort; Davis Strait). [“Skinnier” bears = fewer bears (W. Hudson Bay, 1998-2004)]. Less summer ice ≠ lower cub survival (S. Hudson Bay; Chukchi Sea). 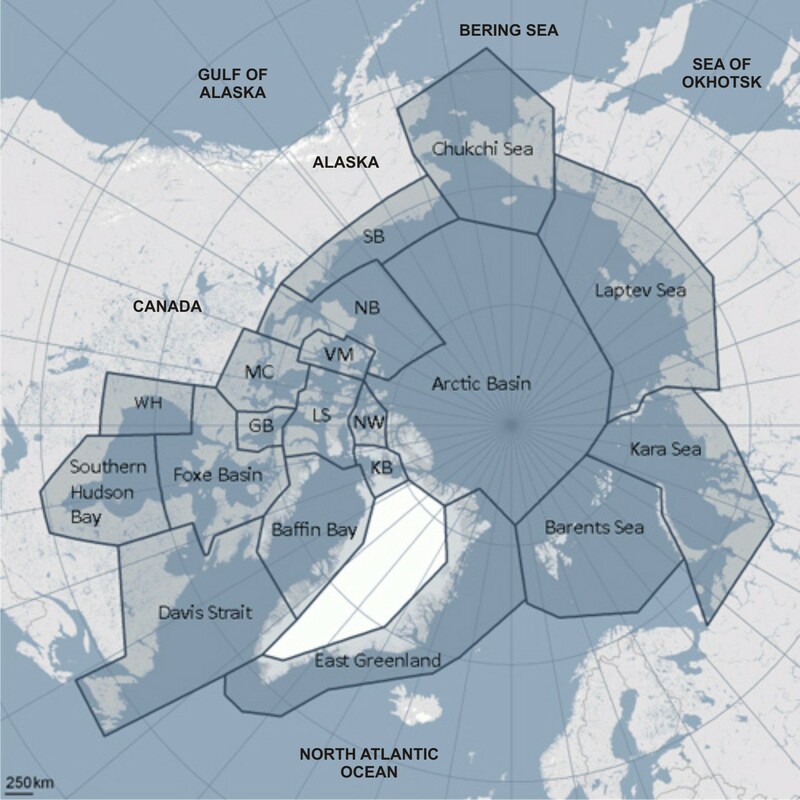 [Less summer ice = lower cub survival (S. Beaufort; W. Hudson Bay, up to 1992 only)]. Negative effects on polar bear populations may occur if Arctic ice-melt in the future advances to the point that mid-to-late spring sea ice is affected. However, virtually all evidence to date indicates that declines in summer sea ice have not harmed polar bears and this means that as far as polar bears are concerned, it does not matter how low the sea ice extent gets in September – whether it’s this September or a future one. Footnote 1. Either Ian Stirling or Andrew Derocher, or both, have been co-authors on virtually all of the polar bear research referred to here, so they can hardly claim they were not aware of results published after their 2012 paper appeared. Ian Stirling is listed as co-author on an extraordinarily large number of polar bear research papers and is currently the longest-serving biologist still active in this field. This entry was posted in Conservation Status, Population, Sea ice habitat, Summary and tagged Arctic, Barents Sea, Beaufort Sea, body condition, breakup dates, cannibalism, Chukchi, climate change, climate warming, Davis Strait, death spiral, Derocher, global warming, harm to polar bears, heavy sea ice, Hudson Bay, hybridization, ice-free, negative effects, polar bear, polar bear numbers increasing, Polar Bear Specialist Group, Polar Bears International, prolonged ice-free season, ringed seals, sea ice, sea ice decline, September ice minimum, Stirling, summary, summer ice minimum, victim of climate change. Bookmark the permalink.